Single weight letter sent from New York to London via Boston on board Cunard's "Britannia" in March 1841. Postage due in GB: 1/- in manuscript comprising packet fee of 1/- including delivery in GB. 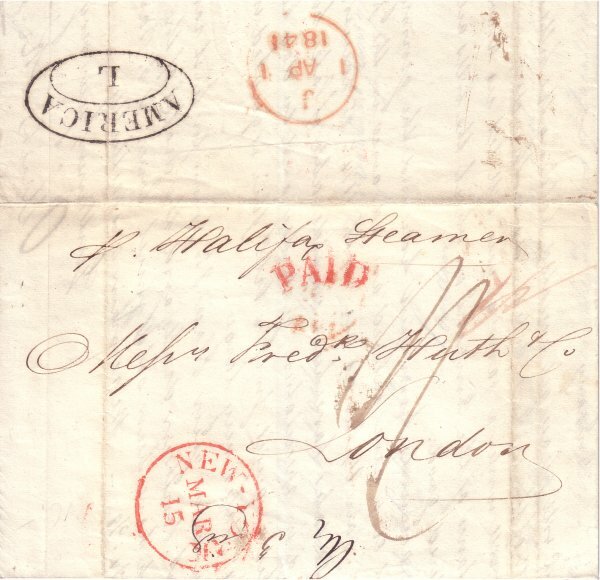 Packet Mark: Robinson / Tabeart type P2, in use at Liverpool 1840-1844 for mail carried from Boston by Cunard. The GB packet fee of 1/- for the first half ounce was introduced 10th January 1840.